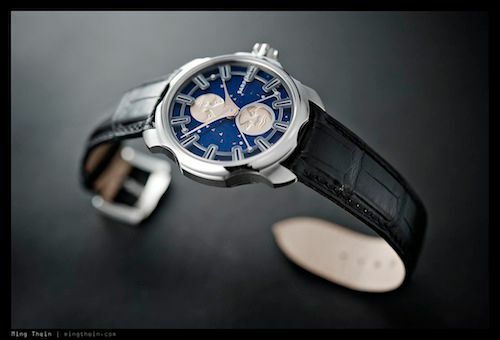 Suppose you wanted a watch with a ginormous moonphase display – what would be your choices? Actually not many. 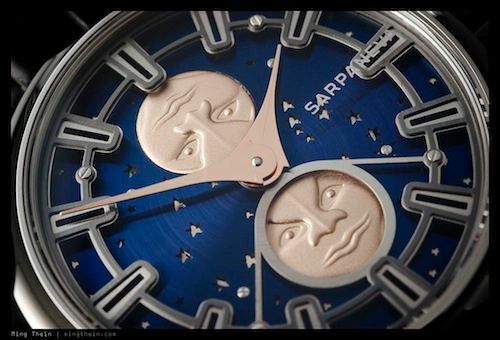 And I can’t think of any that have a larger and quirkier moon than the Sarpaneva Northern Stars, introduced at Baselworld 2011. 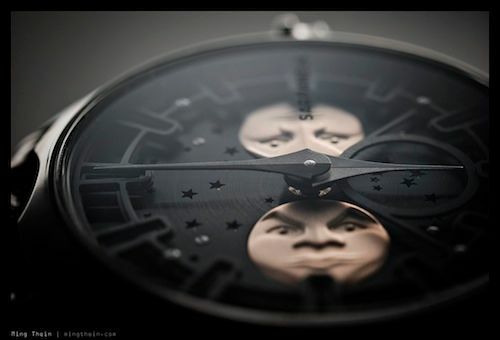 Fully taking up a good 60% of the distance between the hands and the edge of the dial, I’m not sure how much physically larger you can make the moon without resorting to a clock. What’s more, there are actually two moons, the lower of which is framed by vestigial traces of an aperture to indicate its phase. So where do the eponymous stars come into the picture? Well, the disk holding the moons is solid, but has star-shaped cutouts which are nicely delineated by the polished plates underneath the ‘dial’. 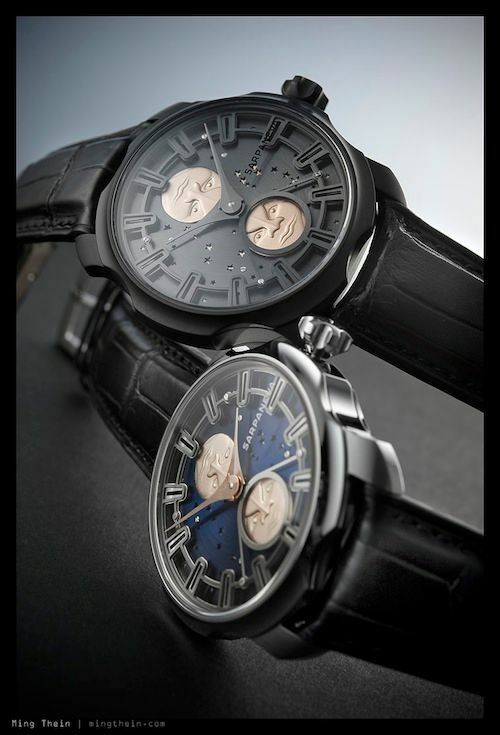 In true Sarpaneva style, the watch has no dial per se but a couple of layers of openworked plates which serve as hour indexes, their frames, and the moonphase aperture. 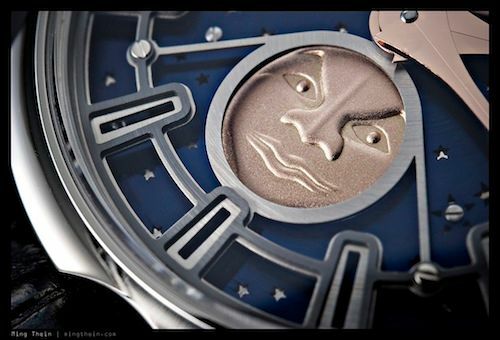 The rotating plate carrying the moons itself is the dial. 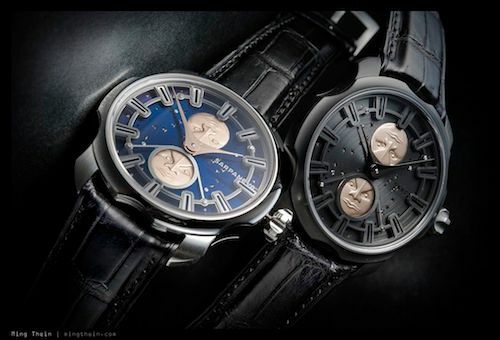 So far, there are two versions of the Northern Stars available – both in stainless steel; one polished with a blue dial, the other with a matte black DLC case and black dial. The samples I photographed both have rose gold moon inserts, though I also believe there are white gold variants (and gold cases too) – making for a mind-boggling number of color combinations. Good thing they’re limited to 10 pieces per variation. 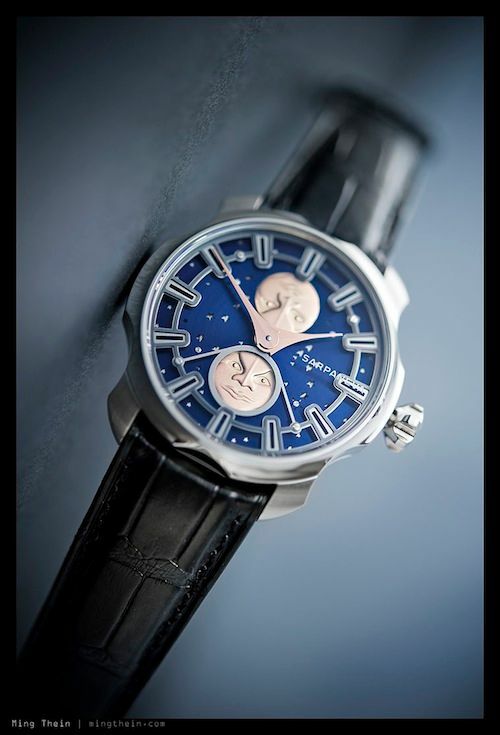 My personal preference runs to the steel/ blue dial version, as the contrast is better and the moons ‘pop’; but I think the overall design would look more harmonious if the hand and moon materials were to match. 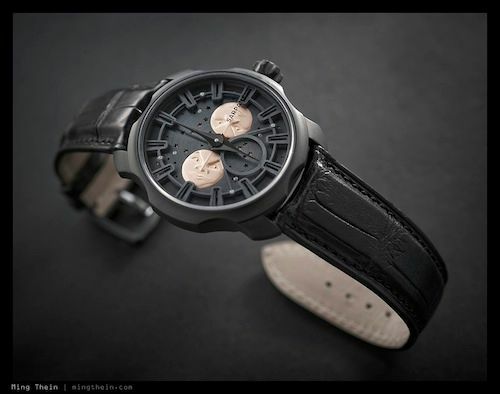 The black version also had black hands, which makes it nearly impossible to read – a no-no in my book, given the primary function of any watch is to tell the time! 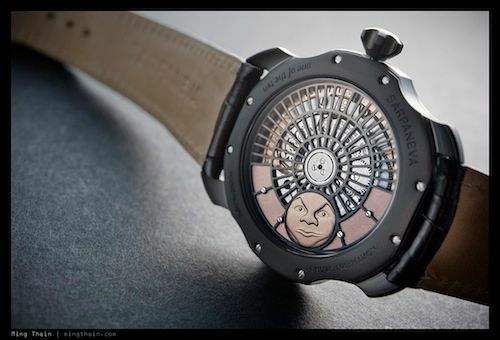 Movement-wise, the Northern Stars are powered by a modified version of the same Soprod A10 that Sarpaneva has used in his other watches; it also has the attractive signature skeleton rotor (I like to think of it as a manhole cover) and gold oscillating weight. 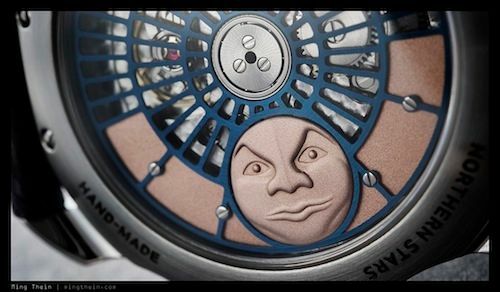 It’s difficult to say if there are any other changes beyond cosmetics (and obviously, the moonphase mechanism which is driven off the former date change train) and finishing without disassembling the watch. This is a good and bad thing, obviously, as a standard movement should be easier to maintain in the long run – but of course lacks the pedigree sought by serious collectors. I think the Sarpanevas sit in an interesting niche. On one hand, they have very attractive and instantly recognizable design cues. Finishing is excellent, the cases are very well put together and comfortable to wear, ergonomics cannot really be faulted, and there are nice details like multi-layer antireflective coating and the printed logo on the underside of the sapphire. However, I’d personally like something a bit more special under the hood for the money – the Northern Stars occupy a higher pricing tier than say a Jaeger-LeCoultre Grand Reverso GMT – which arguably offers considerably more bang for the buck. For some, though, uniqueness and reliability are a persuasive combination, and in this sense, the Sarpanevas are not a bad deal at all.